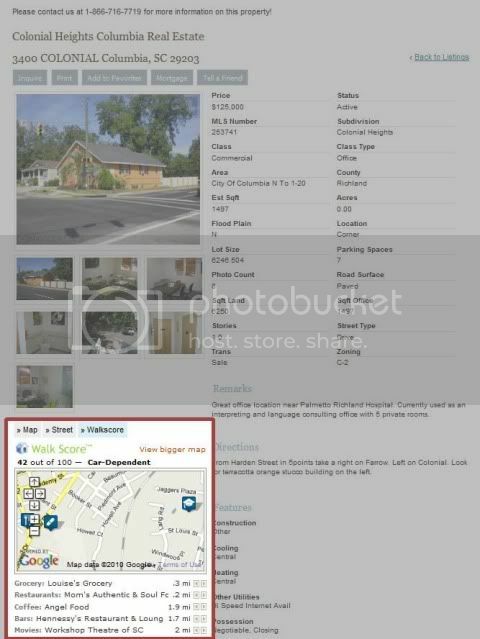 We've just added Walkscore to our Columbia real estate listing search. Walkscore will give you some information about the location of homes for sale in Columbia and what vendors you may find nearby. It is an excellent tool if you are unfamiliar with the neighborhoods in Columbia SC or want to know more about shopping, dining, and attractions in Columbia. Simply view a listing and Walkscore will automatically key in the street address with distances to different businesses. This will be very helpful if you decide to move to The Vista, Downtown Columbia, Shandon, or other areas around the city of Columbia, Blythewood, Irmo, or anywhere that the Columbia SC MLS coverage area.